After complaining a bit about Opal sock yarn when I was working on the Opal Clouds Socks, I started another pair of socks in, you guessed it, Opal sock yarn. This time, it’s Opal Elemente, which is a more classic Opal colorway. This is the reason so many sock knitters like Opal. with a few modifications. I cast on 72 stitches, did 20 rounds of 2 x 1 cuff, and turned a Fish Lips Kiss heel. The Fish Lips Kiss heel fits me perfectly. I’ll finish off with a round toe instead of a wedge toe because a round toe just fits me better. And, of course, I am knitting the sock in just one color. I’m using one of my new Hiya Hiya sock needles, 2.5mm, and I must say that I like this needle a lot. The points are very sharp, which I like, and the cables are flexible without being too floppy. And the length of the cable is perfect for doing Magic Loop. I think I like the Chiao Goo Red Lace needles just a teeny, tiny, little bit better than the Hiya Hiyas, but it’s really six of one, a half-dozen of the other. I’m happy with the yarn, happy with the needles, happy with the pattern. Life is good. 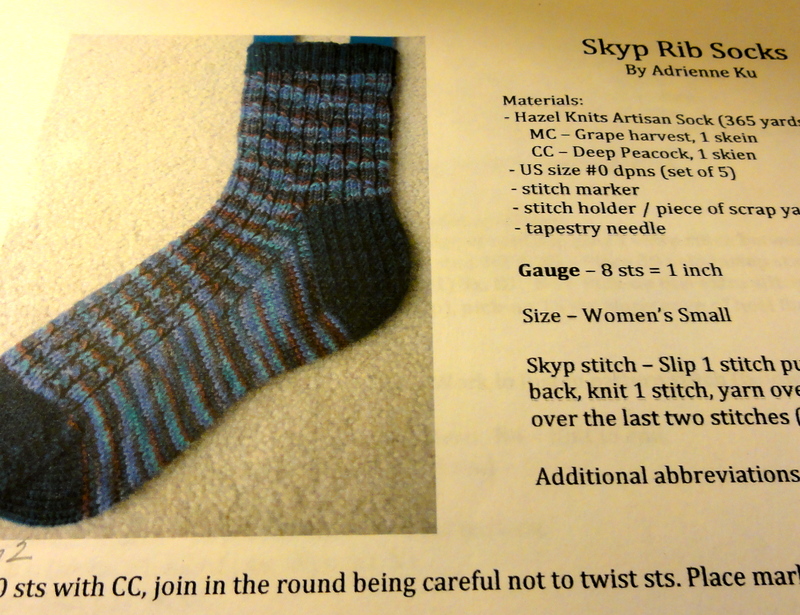 This entry was posted in Knitting, Socks and tagged Fish Lips Kiss Heel, HiyaHiya circular needles, Magic Loop, Opal Clouds Socks, Opal sock yarn, Skyp Rib Socks. Bookmark the permalink. It’s a workhorse sock yarn, like Trekking XXL, Regia, and Socka. It’s pretty soft and wears hard, but it’s a little bit splitty. Some of the patterns and color ways knit up really nice, but some of them just don’t appeal to me. Different strokes n’at. I’ll be taking a closer look at Opal yarns soon. I love the colorway you chose for your socks. I’m sure you will find some colorways you will love.